The Baudelaires are on their own as they hurtle towards one of the most grotesque and miserable settings in A Series of Unfortunate Events, and that’s saying something. After their narrow escape from the Village of Fowl Devotees, with Olaf and his henchmen hot on their heels, they find temporary refuge with another VFD group. This time, they are the chirpy, hippie-like Volunteers Fighting Disease, who are convinced that singing and smiling will cure any disease. These singers luckily don’t read the papers like the Daily Punctilio so they aren’t aware of the orphans’ status as wanted criminals. They arrive at the Heimlich Hospital, a grim structure that looks like you can smell the disinfectant all over it. This is the domain of Babs, head of HR and administration, who is obsessed with paperwork. The Baudelaires hear of a certain Library of Records which is said to contain a vast collection of knowledge. They are still determined to learn more about the VFD, especially after meeting, albeit briefly, Jacques Snicket and learning that the tattoo on his ankle was not an eye. Olaf and Esme pursue them, with the latter more concerned with recovering a certain sugar bowl that she claims Beatrice Baudelaire stole from her. Later in the episode, Lemony Snicket confesses that it was he who stole the sugar bowl. The sugar bowl is briefly seen tucked away in a closet and when the hospital eventually burns down, someone is shown taking it away. 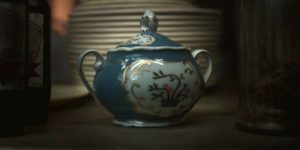 Even those who have the read the books in A Series of Unfortunate Events are unsure on the real significance of the sugar bowl and the secrets it holds. Hopefully, the show will reveal more about it as it goes on. 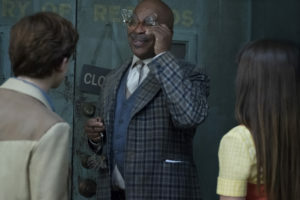 The Baudelaires befriend the kindly keeper of the library, Hal, who has devoted his life to filing everything in the library, though in a very arbitrary and not-at-all efficient way. But he means well, brings them chicken soup, and declares that he trusts them, which makes it all the more painful for the Baudelaires when they have to betray him by stealing his keys to access the library. He later discovers their deceit as well as witnesses the destruction of his life’s work (Esme’s doing, but how is he to know that?) and grows angry at the children. One major discovery they make when they briefly get a hold of the Snicket file was that there might have been a survivor of the fire. So there is a glimmer of hope in all this misery and hardship (though book readers know better, but let’s not spoil anyone’s fun for the moment). Olaf sees the footage and destroys it in anger, starting another one of his vicious fires that destroys the entire hospital. No episode of A Series of Unfortunate Events would be complete without Count Olaf in an unconvincing (to the Baudelaires only) disguise and an even more unconvincing alias. He tops last season’s Yessica Haircut with Dr. Matthias Medicalschool which, as usual, convinces all the idiotic adults in the hospital. 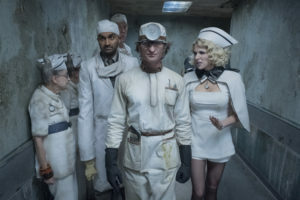 The fun part about The Hostile Hospital is that two of the Baudelaires decide to try their hand at this tactic too, so Klaus and Sunny disguise themselves as Dr. Faustus (so ironic, though the reference is lost on the un-literary adults that surround them). The hilarity of Klaus’ appearance and his posh accent gave the episodes a more lighthearted tone, given that Olaf’s plot was one the most disturbing yet. He saw through Klaus and Sunny’s disguise and set the children up so that the brother would have to saw his sister’s head off. This was unusually gruesome. Once again, thanks to the children’s own ingenuity, they manage to escape but just barely. 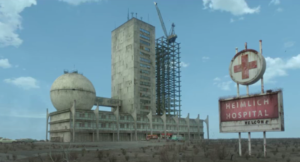 The hospital goes up in smoke and the children are still wanted criminals, this time as arsonists as well. The Baudelaires take the only viable escape route, which also happens to be the riskiest, as they hide in the trunk of Olaf’s car. On the one hand, at least they know where Olaf is. On the other hand, it’s Olaf. But at least they’re still alive and still together. One learns to count one’s blessings when life has become A Series of Unfortunate Events.